fundamentals of rowing and rowing safety. Saturday and Sunday beginning June 23, 2018 from 9:30 am to 12pm. Participants will be asked to confirm their ability to swim. Each day will consist of a 2.5 hour session both off the water and on the water. The course will be held at the Priest River Recreation Ares, “The Mudhole”. PORPA is pleased to announce the course instructor is Dan Gehn, coach of the Gonzaga Men’s Rowing Crew. This four- week course is $300. Payment must be made in advance. Individuals who complete the course are invited to join PORPA and will have a fifty percent discount on a rowing membership in 2018. PORPA has a fleet of 6 rowing shells to include 2 8+s. a 4+, a double and 2 singles and thus can provide a rowing experience at any interest level. To participate, fill out and mail the registration and waiver forms available in the links below or contact us here if you have questions. The expanded fleet is shaping up! We’ve been working on the Vespoli 4+ donated by the University of Oregon. Erwin has been tightening all the bolts and nuts, changing worn pieces, replacing parts with the ones we got from Gonzaga and just doing basic maintenance. In the next few days we will be receiving the replacement rib so that it can be installed together with some other missing and worn pieces that were ordered from Vespoli. Take a look at this beauty, named YAM-PAH-PA which is one of the native American names of the Snake River. The PORPA crew did not let snow stop the holiday fun at Parnell Clydesdale Ranch North of Sandpoint on Jan 7, 2017 ! On Oct 27, 2016, PORPA added a pair of Vespolli racing shells to our fleet thanks to the generous support of the University of Oregon. The shells are being lovingly put to bed for the winter, but we can’t wait to get them in the water with a growing community of rowers next year. After our successful first full season of rowing, the PORPA crowd gathered for to safely tuck away the 8 person shell, celebrate, and socialize with a tasty shrimp boil and delicious homemade desserts. Hopefully you will be seeing our new logo a lot! 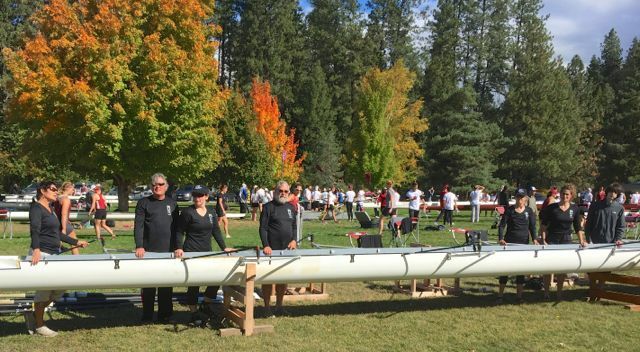 After a summer of vigorous training, the PORPA 8+ crew entered the Head of the Pend Oreille Regatta for the first time. They demonstrated the new colors and skills at the BBQ row-by in gorgeous weather. Unfortunately, a sudden windstorm forced the regatta to be scrubbed. A disappointed PORPA crew is looking forward to next year.